Constructed from a superior plastic blend, the Countryside Flower Box features a timeless design with a matte finish. The purposeful ridged layers ensure ruggedness and sustainability. These versatile planters can be placed on flower box brackets under windows, on porches and decks, or along walkways. Built-in feet provide proper airflow and reduce the chance of water pooling under the planter. Suitable for indoor or outdoor use. When using outdoors, remove rubber stopper on the bottom of the planter for proper water drainage. Countryside Flower Boxes are lightweight, UV-resistant, recyclable, and proudly made in the USA. 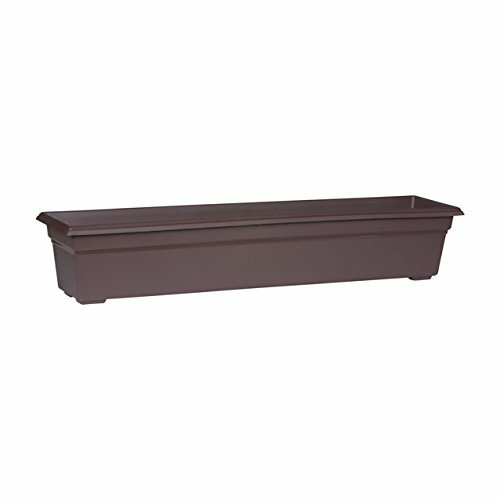 Dims: 36" x 8"x 6.5" (L"xW"xH") Soil Capacity*: 13.9 quarts *Soil capacity measured in dry quarts, one inch from top of planter For best results and to sustain healthy plants in a Countryside Flower Box Planter: • When using outdoors, prior to planting, invert container and remove rubber stopper. Store rubber stopper in safe place to use at the end of growing season. Removing the stopper will allow water to properly drain from the Countryside planter. For additional soil aeration, add a soil amendment such a perlite, small stones, or clay pieces to the bottom—and up to 1/3—of the container. • When deciding what to grow in the flower box, check the planting instructions for the specific plant species. Follow the directions and, if planting multiple seeds or seedlings, place each plant the recommended distance between each plant to allow enough space between them to grow • Position the flower box in an area that will receive the recommended amount of sunlight per the plant’s instructions • Add potting mix to fill the container up to 1" from the top • Water accordingly and often, especially in mid-to-late summer, high-temperature months. • Although the Countryside Flower Box Planter is frost proof and can survive the winter, to promote longevity of the containers, we recommend moving plants and containers indoors. Either insert rubber stopper on the bottom of the planter and grow your plants indoors; or empty the flower box of any residual water or dirt, clean with warm soapy water and store in dry area.